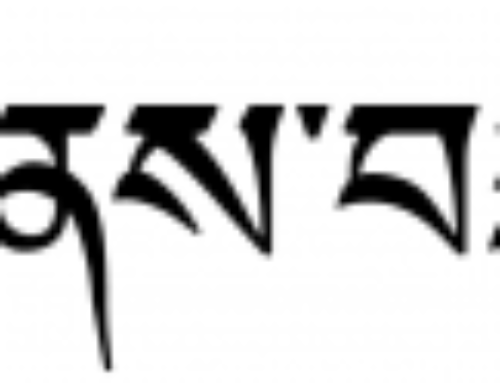 The Tibetan word tendrel (rten ‘brel) is an abbreviation of the term ten-ching drelwar jungwa (rten cing ‘brel bar ‘byung ba). It is a translation of the Sanskrit term pratitya-samutpada, which has been variously translated as “dependent arising, dependent co-origination, interdependence, relativity, auspicious coincidence,” and so on. Pratitya-samutpada is the technical name for the Buddha’s teaching on cause and effect, in which he demonstrated how all situations arise through the coming together of various factors. In the hinayana, it refers in particular to the twelve nidanas, or links in the chain of samsaric becoming. These twelve are portrayed in the familiar drawing of the wheel of life. When the practitioner is finally able to break one of these links—for example, by overcoming ignorance or attachment—the entire cycle of suffering ceases and enlightenment is attained. This famous mantra is actually a summary of the teachings of the Buddha. One of his first five disciples, the arhat Assaji, was asked by Shariputra, a wandering ascetic, what his master taught. Assaji replied with this statement (probably without the OM and SVAHA). Translated, he said, “Regarding dharmas that arise from a cause, the Tathagata taught their cause and also their cessation. Those were the words of the Great Mendicant.” Upon hearing these words, Shariputra attained to the first stage of the path, entering the stream. For many centuries now, this mantra has been used to stabilize the power of blessings in one’s mantra recitation, as well as to purify dharma practice, especially any misunderstandings of the view. That itself is the middle way. This verse forms part of an exorcism liturgy, which is traditionally practiced on the 9th, 19th, and 29th day of the lunar month. By chanting the verse and recollecting the meaning of tendrel/emptiness, obstacles are banished. This idea of auspiciousness is usually either regarded as just a form of speech or associated with superstition. It involves a sense of power. The word for “auspicious” as it related with this notion of “coincidence” or tendrel is, in Tibetan, tashi; in Sanskrit,mangalam. Auspiciousness is an aspect of coincidence, of this meeting together of conditions. The movement of ignorance and feelings and perceptions, and so on, is an auspicious one, in a sense, an appropriate one; because all of these twelve causal links are related to each other continuously, infallibly. In other words, there is no mistake about what is happening. Everything is right and appropriate at that very moment. That is what mangalam is, or tashi—a blessing.